We’ll talk once again about everyone’s favorite Instant Messaging platform, Discord. This time we’ll address another big aspect that was tackled during the interview with Rolling Stone’s Glixel. Jason Citron has talked about how the development team plans to tackle groups belonging to the Alt-Right. Discord as a platform offers a lot in regards to the features it has. From the ability to create private servers for audio and text chats to Screen Sharing and Video Calling which have been implemented recently. The service is at 87 million users with 14 million daily active users sending 9.5 billion messages a month. “This year we saw tremendous growth, but it’s been a steady build since we launched,” Citron says. “The growth curve is such that it takes time to build to scale.” Jason believes that Discord’s growth is due to the grassroots powered by word of mouth. However, there’s a problem with apps that allow secure form of communication to its users. This is one of the reasons why Telegram and WhatsApp have been generating some controversy as of late. While they ensure protection towards users, it also offers it to people with horrible intentions. This all culminated in a video essay that currently sits at 52 Thousand Dislikes mainly because of how vague it is. However, the point that this is trying to convey is that Alt-Right users have been using this platform FOR GAMERS to push agendas and to perform “Anti-Rally” efforts like the one in Charlottesville. 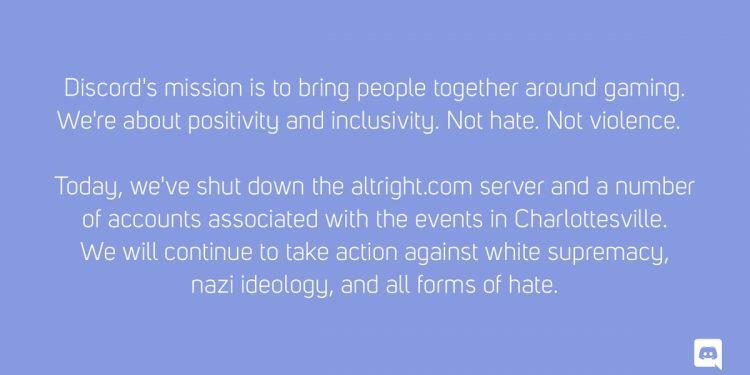 Following the rally, Discord banned several of the largest alt-right servers and publicly condemned “white supremacy, neo-Nazism, or any other group, term, ideology that is based on these beliefs,” in a public statement. The problem is, these groups are still showing up in Discord Server lists. However, Citron also talked about how much disdain they have towards the people who use their platform as it isn’t intended. What I dislike about the way the NBC THINK article tackled this issue is how NBC pretty much pinned gamers and the Alt-Right together. Even if that wasn’t the intention of the article or the message, there was a pretty big misconception thrown around about how gamers ARE the Alt-Right. This is the reason why this essay is heavily disliked. However, Citron also notes that Discord has never listened in on people’s conversations or read their messages and has no plans to start doing so. This puts the impetus on users to find and report bad actors. There are a lot of non-gaming Discord groups too. Other non-gaming servers on Discord are built around the discussion of everything from crypto-currency to stock trading, music appreciation to language lessons and fantasy football, Citron said. So, this is pretty much where the whole thing stands at the current time. Discord users are tasked with reporting any suspicious activity coming from users who might be committing atrocious activities in order to keep this service just for gamers. “Our team is available to help respond to requests when people bring them up,” he says. “We have a full-time trust and safety team that is available 24 hours a day and the community is very proactive. I still think that this “Alt-Right” term is bogus, as the people who commit attrocities are varied and will always find a platform to do so. And the problem is, attributing something to a political side often gives fuel to the other to think they have a free pass on doing the same thing.